Published on April 19, 2016 at 9:38 am . For only $40/ ticket, you can help the hospital purchase two pieces of high tech equipment to improve patient care in the Emergency and Maternity Departments. The first is a Transport Incubator for the Maternity Department. According to their website, the Incubator “is attached to a stretcher that will load directly into an ambulance and will provide the warm, safe environment and quick access necessary for optimal neonate care. As for prizes… Their grand prize will be $10,000 cash plus a $10,000 travel voucher offered through The Travel Place. The second prize is a 7-night all-inclusive trip for two to the Playa Mita Iberostar in Puerta Vallarta, Mexico. The third prize is a return trip for two people to any scheduled WestJet Destination– will it be Barbados, Mexico, Montreal, New York? There are plenty of places to choose from! Tickets are now on sale! According to their website, there are just 2500 tickets total. The first 499 tickets will be sold for only $40/ ticket and the remaining 2001 will be sold in sets of 3 for only $100/set. Published on June 8, 2015 at 12:45 pm . 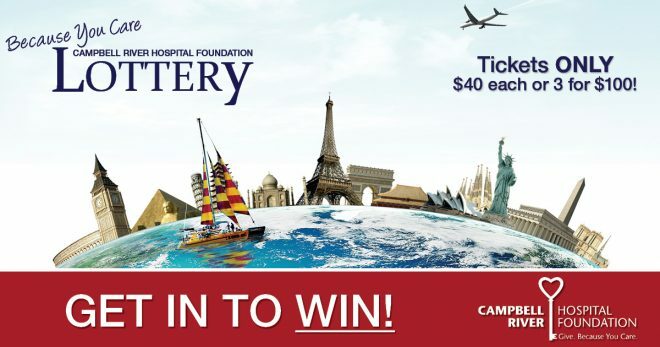 CAMPBELL RIVER, BC, June 8, 2015 — The 2015 Campbell River Hospital Foundation Lottery final ticket sales deadline is 5 pm, June 11, 2015. Published on May 14, 2015 at 8:03 am . Where would you go with $10,000 in cash AND a $10,000 travel voucher? Published on April 30, 2015 at 11:49 am . CAMPBELL RIVER, British Columbia — The 2015 Campbell River Hospital Foundation Lottery is back for the second year.